Susan Oxley, Ph.D., doesn’t mince words when explaining chemistry’s place in the world. “You can be a doctor and help thousands of people, or you can be a chemist and help millions,” Oxley said, quoting her favorite adage. Luckily, her favorite research topics have some of the broadest applications. Oxley investigates and designs chemosensors — chemical compounds that can be used to detect other chemical compounds. She is currently developing a modified chemosensor that can detect the presence of metal ions, such as calcium and magnesium, using fluorescence. Oxley anticipates this will allow detection of very low concentrations of metal ions, while being selective about what is detected. Still, Oxley considers herself an educator above all else. She designs research experiences to show how questions can be answered though experimentation and data analysis. She often invites her students to participate in her own work with chemosensors for hands-on enrichment. Earlier this year, Oxley was awarded the 2014 Distinguished Faculty Teaching Award. 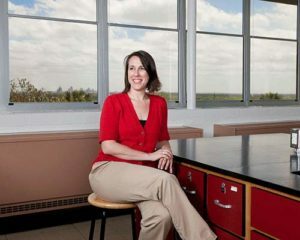 Between creating new chemosensors and guiding her students’ research experiences, Oxley is in her element.